I am stuck at this. Can anyone gives me a pointer or URL to a help site on this? Like there are now 2 bundle ID (one for app, one for the extension), which should I choose when I create an app entry in iTunes Connect? Should I create a special distribution provision profile for it? I have read through the App Distribution web site (https://developer.apple.com/library/ios/documentation/IDEs/Conceptual/AppDistributionGuide/Introduction/Introduction.html#//apple_ref/doc/uid/TP40012582-CH1-SW1) and cannot figure out how to add the entitlements in distribution profile. You need to create one provisioning profile for one target. The host app and its extensions are considered separate targets. You can just tap on the target in Xcode. You can't do entitlement to distribution profile. They are added to the app. Not the answer you're looking for? Browse other questions tagged ios ios8 provisioning-profile ios-app-extension entitlements or ask your own question. Can app created under iOS Developer's account be distributed in iOS Developer Enterprise account? What's with certificate and provisioning profile if I use another mac? 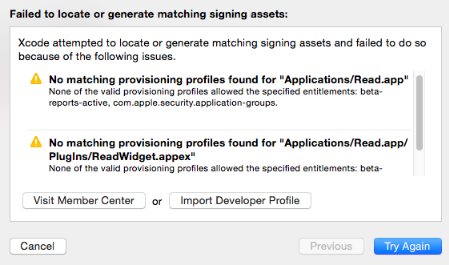 How to resign an app with app store provisioning profile to add beta-reports-active key? How do I sign my iOS application when I don't have an iPhone?